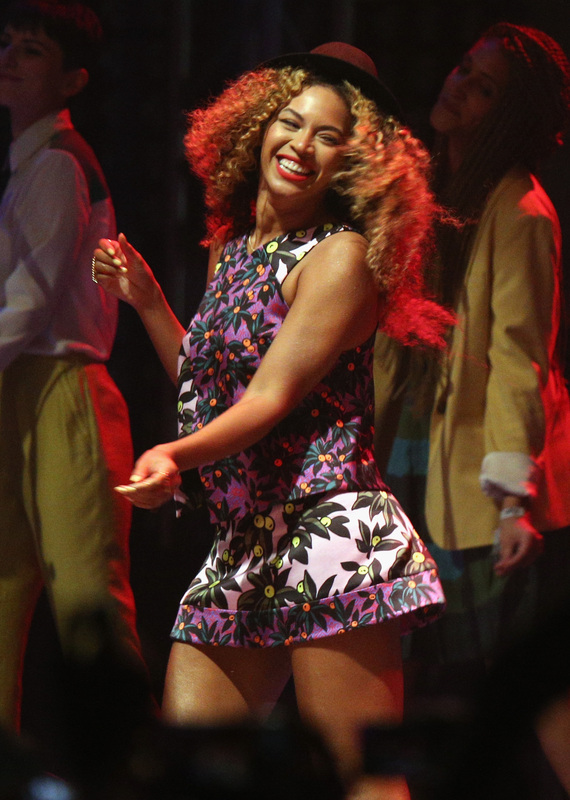 Anyone who's anyone knows by now that Beyoncé made a surprise appearance at Coachella when she joined her sister Solange for a dance routine during her set, but did you know there was another Knowles lady in the desert? Beyoncé's mom Tina Knowles was also at Coachella and photos of her at the festival prove two things. One, she likes dancing almost at much as her daughters, and two, she and Beyoncé might be the same person. In pictures Beyoncé posted on her Tumblr, Tina can be seen hanging out with Solange and dancing while wearing a leather jacket and her long, highlighted hair. Beyoncé, on the other hand, wore big curly hair and a hat — a hat that somehow sticks to her head during dance routines, I might add. If these two switched hair, we would not be able to tell the difference. They could've had some sort of wig trading shenanigans going on all weekend. Was that Beyoncé on stage with Solange or was it Tina? This could even extend beyond Coachella. After Tina stopped making those ridiculous outfits for Destiny's Child, did anyone keep up with her? This Hannah Montana-type situation could have been going on for years. Assuming this isn't actually the case (and we'll never know! ), at the very least we know what Beyoncé will look like at age 60 and she looks freakin' awesome. Beyoncé is already capable of looking much younger than her age, so this is just more proof that the Knowles family genes are something special. At Coachella 2034, Blue Ivy should get in on this too and make it three generations of confusion.